Clearcoat Solutions, CSI was born in the automotive industry, the owner and inventor of the product line was and is a high-end, award winning, automotive refinisher, who was frustrated with the existing products available on the market. What did he do to solve the problem? He when back to school and learned how to make a better product! And that is what CSI is all about. The CSI Cream-X product is revolutionary, it will cut the time you spend buffing and polishing by 60%. There is one product that works the job instead of three. The product is a nano technology water based formulation that will not dry out or become gummy. Along with the Cream-X product CSI has a number of other products that work with the polishing product to help produce the desired results. Annex Paint is proud to carry all of these products which will all be available on line. In addition to the automotive products Annex paint also carries the full line of Marine polishing products. If you have questions on the use of these products we are always ready to answer your questions. 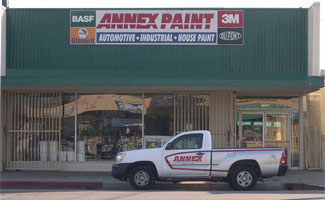 If you are within 60 miles of the Annex Paint store in Reseda California, we may be able to come out to your shop and demonstrate the products with you first hand. Contact, Greg at the Annex store for more details. X-treme Yellow Finishing Pad, 6"